Have you ever tried couponing? If not, you've surely heard about it. There's even a television show about it. I've tried it in the past, became quickly overwhelmed, and didn't last long. When I was given the opportunity to review the book Couponing Made Simple from Christi the Coupon Coach, I was cautiously excited - I wanted to try again, and her book talks about "real couponing for real people." I can't do extreme couponing, but I can do normal coupon shopping. For the purpose of my review, I received a copy of the e-book. Christi Bassford is a mom of four, with a desire to be a good steward of God's money. She started out doing what I usually do with coupons - using a few here and there, buying generic brands, and suffering sticker shock at the cash register. 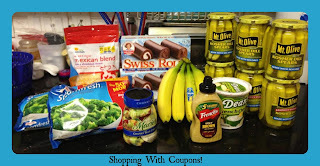 Once she discovered the tricks to couponing, she found she could save her family a lot of money, which they are they able to put to use elsewhere. Now, she wants to share her knowledge to help other families save money, too. True to her word, Christi walks you through a very simple, efficient system for organizing and managing your coupons. I purchased three things: a hanging file box, a small index file box with a locking clasp, and an 8.5"x11" organizer, with pockets for full-size sheets of paper with smaller pockets on the front of each one. Christi uses an accordion file. I have one of those too, but I like this bigger one. It took very little time to set up the system, and less than an hour each week to get the coupons sorted and filed. It might take me a half hour to make a grocery list using a coupon match-up site, and then a few minutes to get the coupons together. It really is an easy system to use. Her book also walks you through different places to find coupons. I buy 6 newspapers every Sunday (as long as there are coupons - you can find out about that online), but there are TONS of other sources. I also print a lot of coupons from online sites. You learn to keep an eye out, and it's amazing where you find coupons, and what you can use them to buy! Christi has a list of her favorite websites here. Christi not only shares her couponing knowledge, but she also talks about other ways to save money. She talks about shopping for quality - sometimes things that seem more expensive can be a better value overall. She also talks about thrift stores and garage sales. I am getting really good at shopping for books at thrift stores. I'm working on starting a library of living books, and I have found some real treasures at our local thrift shops. Paying $.50 for a book in good condition is even better than finding something for $.01 on Amazon - you still have to pay $3.99 shipping! As I worked through the review period, there hasn't been a lot on sale that I needed to buy. That's just the season, though. We do a lot of our shopping at Sam's Club, so we have some things, like toilet paper, in mass quantities. Also, during my last coupon venture, my husband got a little frustrated with me. I tend to get excited about really good deals, and spend too much money. I'm going to work up to having him see that couponing is a good thing, and prove that I can stay within our budget, too. On my first trip with coupons, I went to Target for laundry detergent and toothpaste. Big fun, right? :-) A coupon matchup site I like to use showed that 100 oz bottles of Tide were on sale for $11. When I got to my Target, they were full price - $11.99 - BUT when you purchased two containers of laundry detergent for $11.99 each, you received a $5 gift card, which brought the price per container down to $8.49 each. Whee! Now, these were BIG containers, so I didn't need twelve of them. I bought 4. I had a coupon for $3 off 3 bottles, another for $0.40 off one bottle, and 3 different Target e-coupons for $1.00 off Tide/laundry detergent. After all was said and done, and counting the $10 I received in gift cards, I paid $7.89 per bottle - that's almost 66% savings! During the same trip, I knew we needed toothpaste, and Target had some on sale. Christi states in her book that she tries not to pay for toothpaste; she's found she can get it for free by watching for deals. However, because we were pretty much out at home, I had to buy some. I bought 3 tubes of toothpaste (2 Crest, 1 Colgate) on sale for $3.50 each (reg. $4.09). I had coupons for $0.75 off each tube, plus a Target e-coupon for $1.00 off one tube of Crest. I ended up paying an average of $2.41 per tube, for a savings of almost 59%. I will take that! It wasn't free, but it wasn't too shabby for a needed purchase on short notice. Now, our Target store doesn't double any coupons, so if I can find a good sale at a grocery store that does, it's better to go to the grocery store. Still, you can definitely find deals at Target. There are coupon websites that focus on getting the most for your money from stores like Target and WalMart - do an internet search for them if you shop at those stores a lot. Unfortunately, the store that has the best coupon deals in our area, in my opinion - Harris Teeter - left our town, probably 2 years ago now. I was SO bummed. That was another reason I stopped couponing. The store nearest me, Food Lion, doesn't double any coupons, and the other one I like, Lowe's Foods, used to only double up to $0.50. While looking up coupon policies, I did learn that Lowe's will double anything up to $0.99 now, so that was good news! I might try shopping there again. One thing that makes me giggle when coupon shopping is the bizarre collection of items I have at checkout. Can you picture what a meal would look like with bananas, broccoli, pickles, and shredded cheese? Ha! Anyway, the total for my order, regular price, was $36.28. With my customer loyalty card and coupons, I saved $10.32, so about 28%. That percentage would have been higher if I hadn't purchased the bananas, which were not on sale, or the Little Debbies, for which I had no coupon, or the goldfish crackers my son snagged in the checkout lane, or the soda I purchased for my daughter who wasn't feeling well. :-D That impulse shopping will get you every time! I primarily went for the pickles. They were on sale, 2/$4, regularly $2.49. I had a 6 coupons for $.50 off one, bringing the price down to $1.50 each. That's about 60% savings! Here is something to note: On my favorite coupon match-up site, it showed that Food Lion had pickles on sale for $1.50 for a 24 oz. jar, apparently all varieties. When I got there, my store had them 2/$4, and my favorites, the baby dills, were not included in the sale. Let this be a cautionary tale for you: it's important to pay attention to your local ads to be sure your sales are the same. I have been caught a couple times at the store, unable to find a sale because it was different for me locally. I have been pleased with my shopping results using Christi's system. One thing I know about couponing is that it takes practice to get good at it, just like anything else. I hope to involve my children in this venture, so they learn how to be good stewards of their money, too. They will value that skill for a lifetime. If you'd like to get started couponing, this is a great resource. The price is $18 for the printed book and $4.99 for the Kindle version, and you will probably save far more than that using the knowledge you will gain.